This adult male Wood Stork featured above was very busy as usual yesterday morning, flying back and forth to the woods to get nesting materials. At one point, he seemed to make an abrupt decision to stop at the very top of the ‘rookery’ island. Interestingly, he landed right above some occupied Cormorant and Anhinga nests, barely visible here in a lower branch at the bottom of the photo. 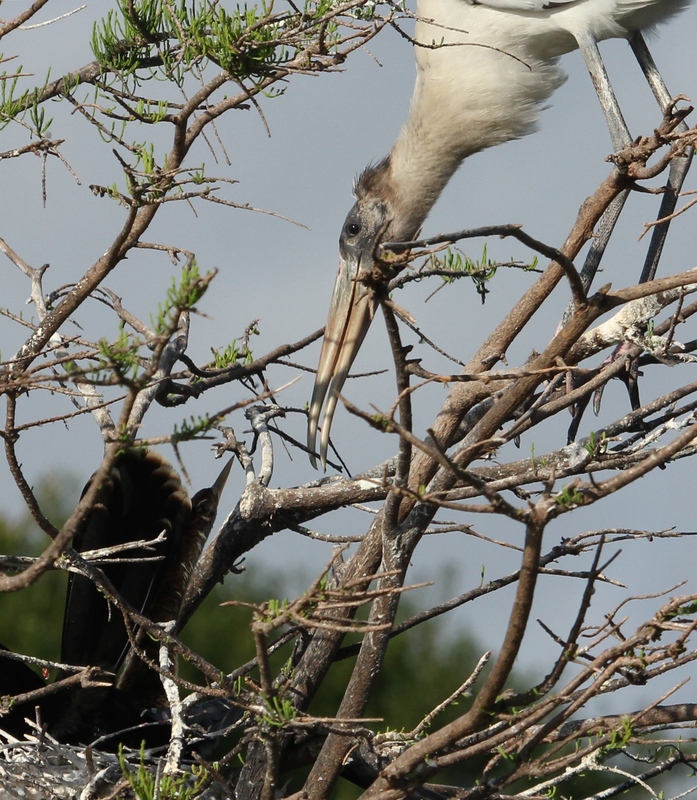 These ‘high-rise’ locations are busy year round with nesting Cormorants and Anhingas. 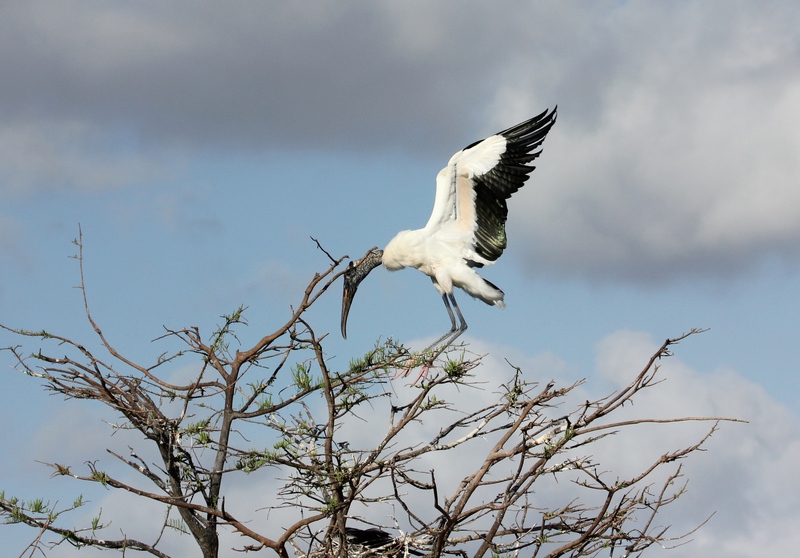 Shortly after the adult Wood Stork took off, a young Wood Stork decided to try out his flying skills and brave a short flight to the same high top branches. I couldn’t help but wonder if he was intentionally copying the adult, or if his tentative hops just accidentally landed him near the Anhinga and Cormorant nests. 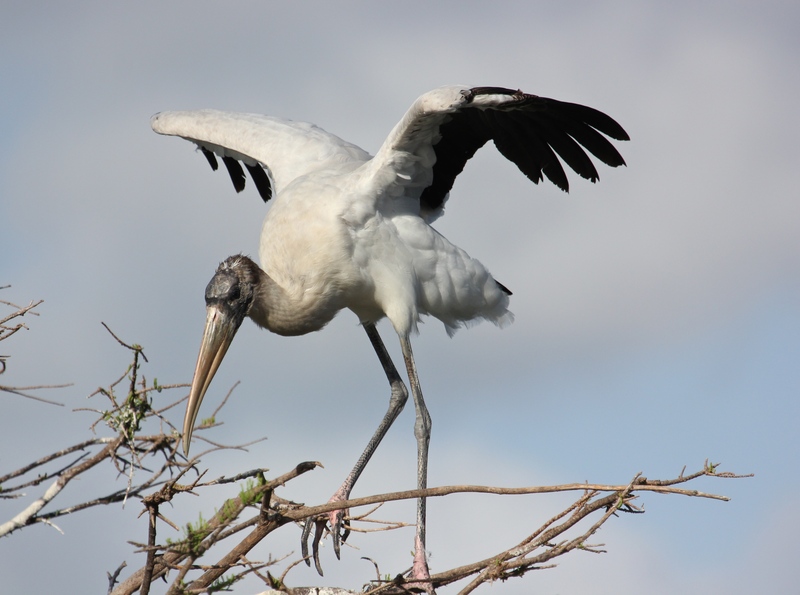 The young Wood Stork had to do some fancy footwork to keep his balance on those skinny branches. 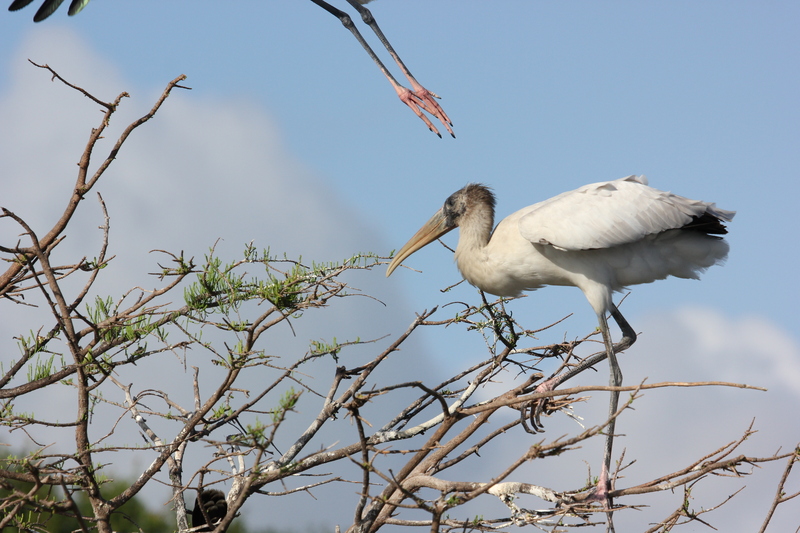 Mr. Grown-up Wood Stork kept returning – as if to check on how the young guy was faring – before taking off again to continue about his errands. I watched the teenager for quite a long time. The young fellow never made an attempt to fly off, or even hop back over to his original location in the rookery again. He just stayed on those high branches. Slowly but surely, though, he inched his way down the precarious branches, getting closer and closer to the Cormorants and Anhingas. As I watched, I realized he had literally come ‘face-to-face’ with a brave little Anhinga, whose tiny head and beak can be seen in the lower left of this shot, in contrast with the huge beak of the Wood Stork. 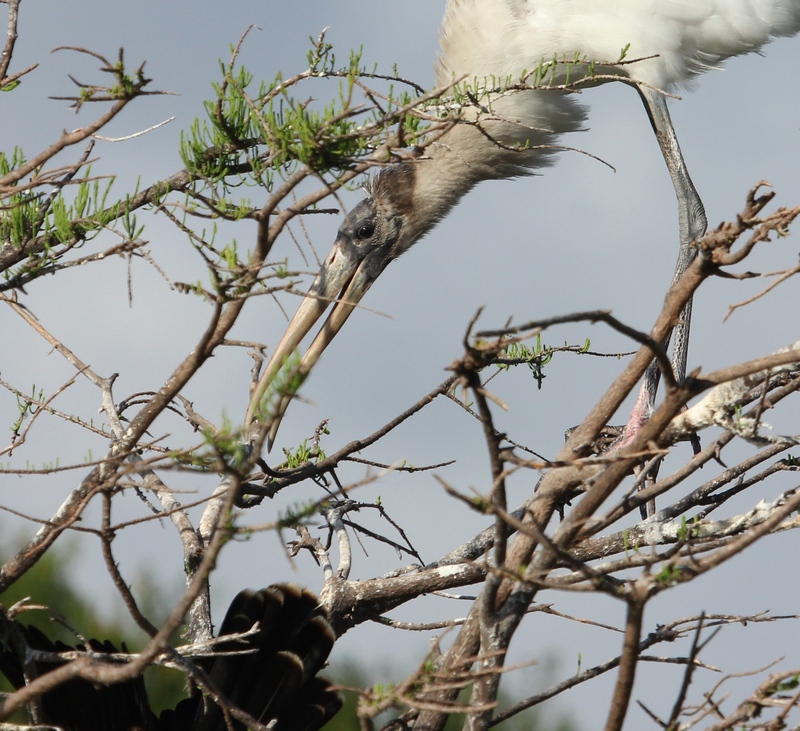 As time passed, the young Wood Stork appeared to convince the Anhinga that he was no threat – clearly, he was just stopping by to pick up some easy-access branches! I watched this whole scene for over 20 minutes. 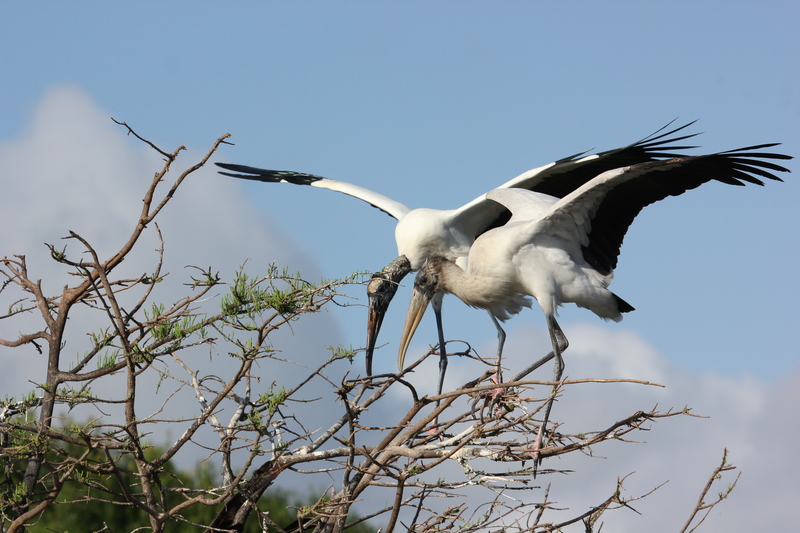 The adult carried on with his branch hunting / delivery service, and the juvenile Wood Stork never got aggressive (as Wood Stork adults are known to do at times! ), nor did he ever return to his original place with his peers. I finally left to continue on my way . . . so much more to see on my morning walk~! 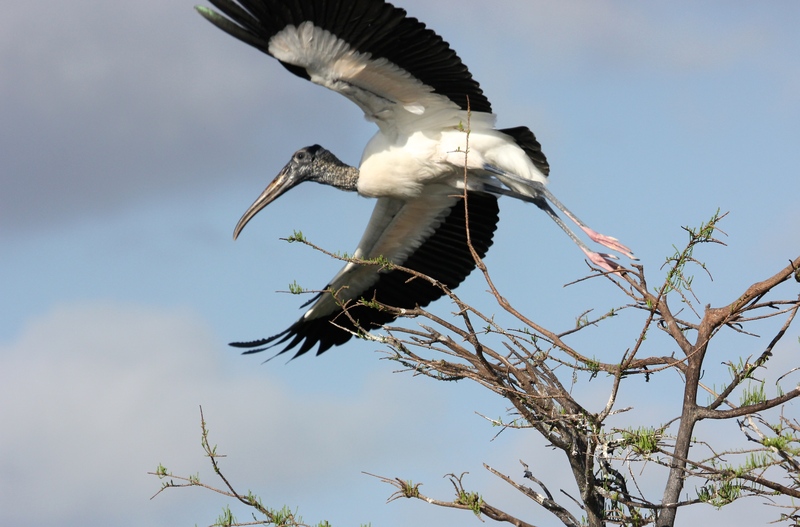 This entry was posted in Birds and tagged Anhinga, Wood Stork. Bookmark the permalink. Very beautiful photos and such a good pictorial story. There really is a difference in size between the birds. Lucky they did not have a squabble. Thanks, Donna! It’s actually quite amazing how well these varied species of birds usually get along, considering how close their nesting areas are to one another – a real cozy community. A beautiful post, and interesting story, thanks for sharing. Thank YOU for visiting, Aussiebirder. Enjoy your day, my friend~! Fantastic shots of these amazing birds! Too funny about the encounter with the anhinga! Glad you enjoyed these, Phil, thanks! I’m always fascinated and often amused by watching the juveniles in action, as they explore their surroundings. We have lots of nesting Wood Storks this year, and some very young Wood Stork chicks (they’re never really very “small”!) now, too. Hope I can get some shots of the babies in the coming week. such neat birds. one stopped here at our place in texas one year. it was awesome! thanks for coming by!